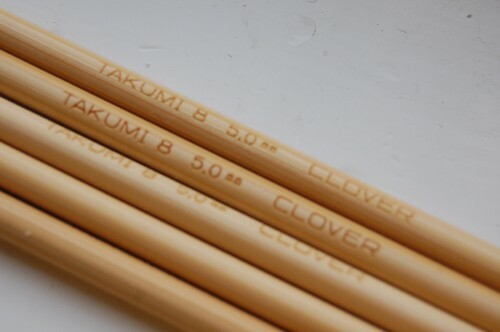 Clover Takumi bamboo needles. (Also, possibly, 2 skeins of Patons Classic Merino in a nice chocolatey brown. $3.79 a skein, score!) They’re my first bamboo – in fact, my first non-metal – needles, and I am entranced. They’re so natural, and light, and pretty (and coughexpensivecough) that I decided they needed a proper case. I see people all over the internet popping out these cute little dpn rolls, and it looked well within my skills as the operator of a sewing machine. Yeah, despite my curtain-sewing prowess, I am somewhat…not inept, perhaps just less ept – differently epted? with cloth and a sewing machine than I am with yarn. Still. As I mentioned, I picked up supplies on Monday. I wanted to use some fabric left over from a dress I altered (I hacked off the skirt and made it into a shirt) which is black with small red flowers. I didn’t bring it with me to the store – small mistake – but picked out another black fabric, some red bias tape, red ‘shoelace’ ribbon, a small package of thin quilt batting, and a card of buttons. Then yesterday I spent a few hours in my closet. The result? It hasn’t quite got a proper fastening yet, and I need to take it back to the sewing closet and further divide some of the pockets so that they’re smaller compartments, but it’s both usable and pretty. I like it! I would do a few things differently if I ever made another one (for instance, you don’t need to turn over a seam you’re going to cover with bias tape) but it was fun. I should really sew more often. Oh! Good news. I found my F hook, so I can finish the pink and yellow church baby afghan! 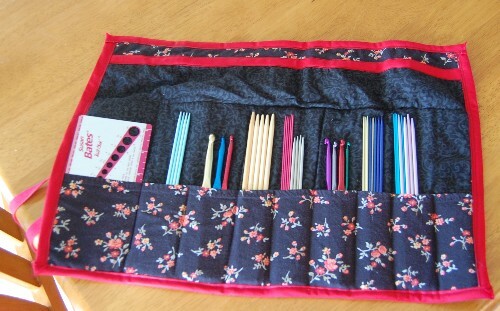 I love my bamboo needles, aren’t they nice!? Ooh, bamboo needles are my favorites! Love the roll you made for them. They are expensive–I like to wait for the 40% off coupons to buy my bamboos. I’m in the process of teaching myself to knit. I have a few aluminum needles and a few bamboo Clovers. I can’t imagine using anything but the Clovers. I love them! 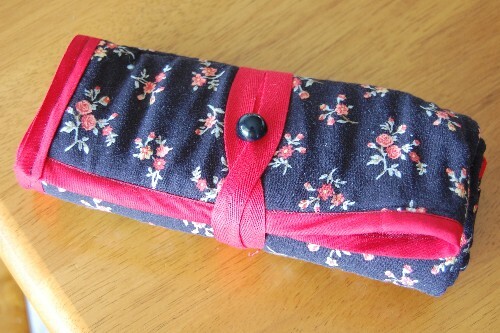 Your needle case is divine. Much better than my store bought one. 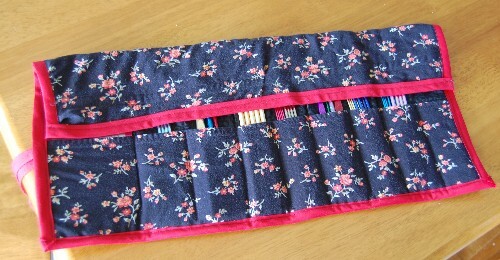 Nice job on the needle case. Hmmm, I think I’m going to need to pick me up some bamboo needles after reading all the raves about them. On second thought maybe I should just wait or else I might go broke buying them in all the sizes.